From our Unique Beaded Fringe Collection (trims under 1 1/2" long)Warm and sultry leaves (or feathers some in our office thought!) tumbled all over each other in this wonderful beaded trim design. 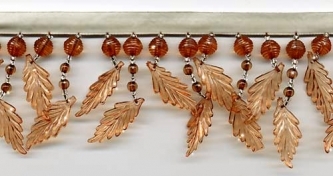 Transparent amber brown leaves hang from sparkling silver seed beads and round amber beads. Flirty and playful! This is a high quality, very full beaded fringe with exceptional detail and craftsmanship. The longer beaded stands are 2" long not including the 1/4" ivory satin ribbon. Perfect for apparel or home decor.